Pitas are those great little pockets that are delicious when filled with salads or dipped in hummus. But turn those pitas into crispy chips, toss them in a salad, and they make a crunchy alternative to croutons. Whenever I have hummus it’s usually as an appetizer or condiment. It’s a wonderful dip for vegetables or warm pita bread and also serves as the perfect spread when filling those little pita pockets. But I’d never considered using the hummus as a base for a salad dressing until my local Ralphs supermarket made the suggestion. It was so easy and such a nice alternative to my standard ranch or Italian dressing, I had to try it out. The end result had the same consistency as a Ceasar dressing but had the flavor of my favorite artichoke hummus. I added some pita chips and a few garbanzo beans and turned my standard pita sandwich into a wonderful dinner salad with half the carbs. Whisk together the hummus and oil in a small bowl and set aside. 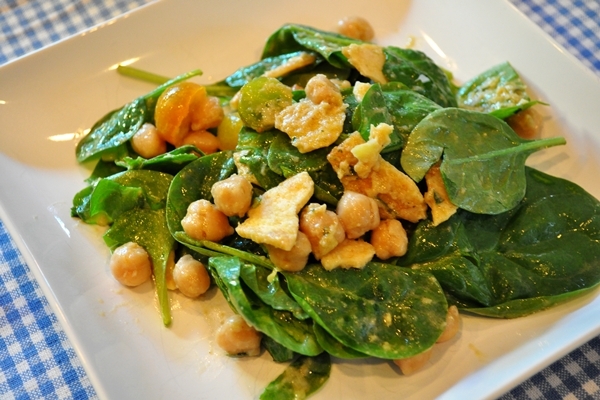 Place the spinach, garbanzo beans, tomatoes and pita chips in a large bowl. Drizzle the hummus dressing over the salad and toss to coat. Serve immediately.